If the walls of this recently sold 1920s Spanish-style villa in Beverly Hills’ sought-after “flats” neighborhood could talk, they would have quite a story to tell—from extravagant evenings spent dancing and partying the night away with the likes of renowned screen legends like Gene Kelly and Frank Sinatra to the private dance rehearsals of an Emmy Award-winning leading lady. Occupying a spacious parcel at 610 N. Arden Drive, the former longtime home of famed South Pacific star Mitzi Gaynor can be found tucked away behind gates along a secluded street just minutes away from Rodeo Drive. 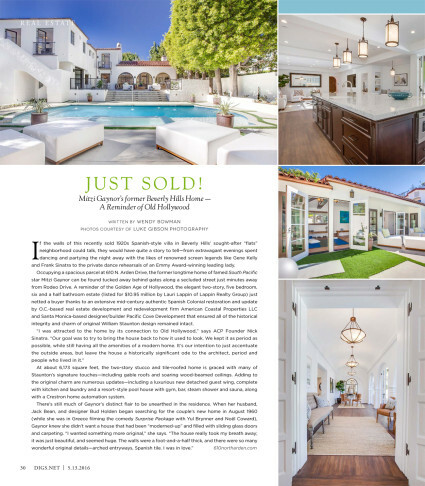 A reminder of the Golden Age of Hollywood, the elegant two-story, five bedroom, six and a half bathroom estate (listed for $10.95 million by Lauri Lappin of Lappin Realty Group) just netted a buyer thanks to an extensive mid-century authentic Spanish Colonial restoration and update by O.C.-based real estate development and redevelopment firm American Coastal Properties LLC and Santa Monica-based designer/builder Pacific Cove Development that ensured all of the historical integrity and charm of original William Staunton design remained intact. At about 6,173 square feet, the two-story stucco and tile-roofed home is graced with many of Staunton’s signature touches—including gable roofs and soaring wood-beamed ceilings. Adding to the original charm are numerous updates—including a luxurious new detached guest wing, complete with kitchen and laundry and a resort-style pool house with gym, bar, steam shower and sauna, along with a Crestron home automation system. WRITTEN BY WENDY BOWMAN. PHOTOS COURTESY OF LUKE GIBSON PHOTOGRAPHY.